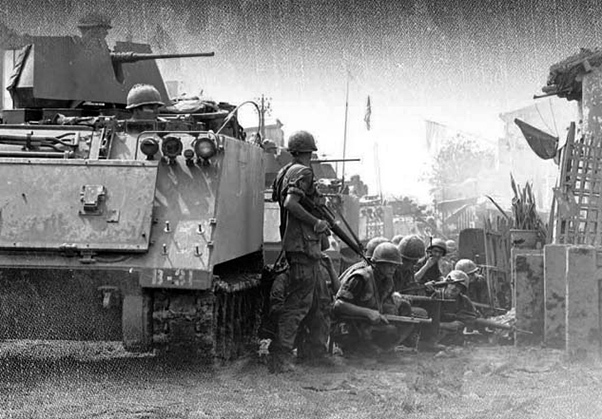 The 47th Infantry Regiment takes the offensive May 1968 in south Saigon. Editor’s note: Early on the morning of Jan. 31, 1968, as Vietnamese celebrated the Lunar New Year, or Tet as it is known locally, Communist forces launched a wave of coordinated surprise attacks across South Vietnam. The campaign — one of the largest of the Vietnam War — led to intense fighting and heavy casualties in cities and towns across the South. 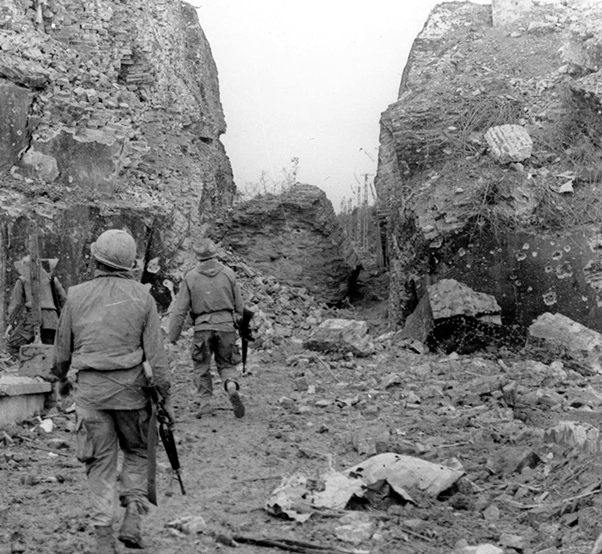 While battles raged for more than a month in some places like the city of Hue, the Tet Offensive was from a strictly military standpoint a defeat for the North Vietnamese and Viet Cong forces. Yet the campaign had a profound impact on the U.S. war effort, stunning leaders in Washington and leaving Americans questioning their country’s involvement in the overseas campaign. Fifty years after their original publication, The Associated Press is making available four stories from Jan. 31, Feb. 2 and Feb. 21, 1968, written by AP journalists Peter Arnett, Edwin Q. White and John Lengel documenting the offensive. The package includes a Pulitzer Prize-winning photograph by the AP’s Eddie Adams. The Communists have paid with nearly 5,000 dead in their frenzied guerrilla strikes at Saigon and other major centers throughout South Vietnam this week, the U.S. Command said Thursday. A soaring general casualty toll was announced as the third day of the coordinated Communist campaign brought new clashes in outlying sections of Saigon and heavy action in other parts of the country. Some Viet Cong soldiers and agents were reported circulating openly in some crowded sections of Saigon, knocking on doors and telling occupants, “We have come to liberate Saigon.” There were reports that the Communist National Liberation Front was claiming formation of a revolutionary council to run Saigon. Command spokesman said 4,959 enemy were killed in action from 6 p.m. Monday to midnight Wednesday. Another 1,862 persons were seized as Viet Cong suspects. U.S. casualties for the period were listed as 232 killed and 929 wounded. South Vietnamese government casualties were 300 killed and 747 wounded, a spokesman said. Other allied casualties were put at three killed and 22 wounded. Army of the Republic of Vietnam Rangers defend Saigon during the Tet Offensive of 1968. South Vietnamese authorities said 660 Viet Cong were killed in Saigon alone in less than two days of fighting. There was no immediate word on the number of civilian casualties in the capital or elsewhere across the nation, but they were believed to have been heavy. Downtown Saigon was quiet early Thursday, but skirmishing continued in suburban areas, and bands of Viet Cong, some disguised in government uniforms, roamed the city. The Communists captured part of Hue, the old imperial capital 400 miles north of Saigon, and seized control of half of Kon Tum in the central highlands. Two other major cities along the coastline in the north, Nha Trang and Qui Nhon, came under fresh mortar attacks and ground probes. President Nguyen Van Thieu declared martial law throughout the nation in the wake of the Wednesday attacks against the U.S. embassy and military and civilian installations from Hue to the Mekong Delta. Traffic began to move on Saigon streets on Thursday, and some shops and offices cautiously opened their doors. Military and police patrols were heavy throughout the city, however, and streets were crisscrossed by barbed-wire barricades and checkpoints. During the morning Thursday, a Vietnamese police precinct station in Saigon’s Chinese sector, Cholon, came under heavy attack, and sharp exchanges of fire were reported in areas of Gia Dinh, the province that surrounds Saigon. Troops and aircraft also swept parts of sprawling Tan Son Nhut air base on the edge of the capital, where heavy fighting occurred Wednesday. View of the Thon La Chu Woods. During the night, one spectacular clash took place in the old French national cemetery only about 12 blocks from downtown Saigon. Persons living in the area said roving bands of Viet Cong surged through, pounding on doors and trying to arouse residents. Government troops rushed in, and the Viet Cong slipped into the cemetery, where many heroes of Vietnam’s wars are buried. Helicopter gunships were called in, and the cemetery and nearby residential streets were hit by rocket and machine-gun fire before the Viet Cong fled. There was no report on casualties from that clash. Similar incidents occurred in other areas of the capital. Small paper red, green and yellow Viet Cong flags were found fluttering in parts of the city at daylight Thursday. Soldiers of the 5th Battalion, 7th Cavalry, fire on Thon La Chu. Widespread, savage fighting ranged into the fifth day in key South Vietnamese cities Saturday. The U.S. Command reported 12,704 enemy had been killed since Monday evening in allied counterattacks that were said to be crushing the biggest Communist offensive of the war. Fresh fighting broke out in parts of Saigon, and masses of civilians were reported fleeing a battle in a northern suburb of the capital. At Hue, the old imperial capital far to the north, South Vietnamese forces reported capturing an airfield inside the city’s walled citadel. The Communists launched heavy ground assaults on at least six provincial capitals and district towns in the rice-growing Mekong Delta below Saigon and in the provinces just north of the city. Enemy gunners hit the U.S. air base at Da Nang with 40 rocket rounds. Damage to the base and its planes were reported light. It was the third attack on the base in the last five days. The Viet Cong killed six American missionaries in the Central Highlands, a missionary organization announced. The U.S. Command said enemy fighters were killed at a rate of 124-plus per hour during the 102-hour period from 6 p.m. last Monday through Friday midnight, making the total 12,704. Allied forces also reported they detained 3,576 enemy suspects. 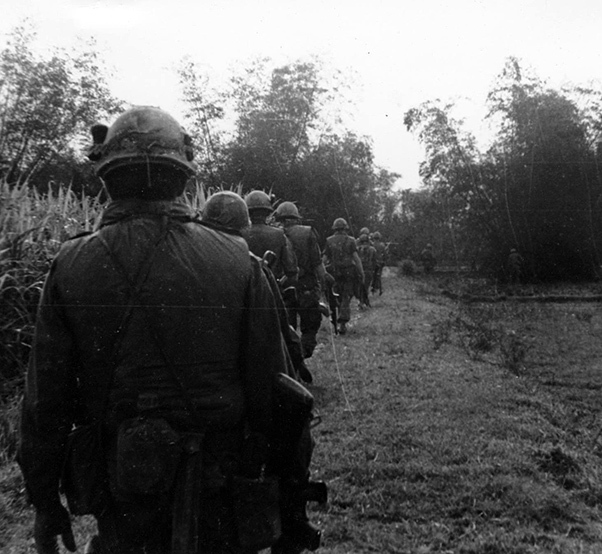 A total 983 allied troops were killed in the 102-hour period, including 318 Americans and 661 South Vietnamese. Allied wounded totaled 3,483, of whom 1,639 were Americans and 1,792 South Vietnamese. Thieu and U.S. Ambassador Ellsworth Bunker appeared on television Friday to tell the people that the guerillas and their North Vietnamese allies were being beaten with unprecedented losses. A battalion of South Vietnamese Rangers was reported moved into Saigon to reinforce security units. The U.S. Command reported heavy contact with the Viet Cong about daybreak Saturday in the Gia Dinh area on the northern edge of Saigon. It said the enemy was blocked by a South Vietnamese force on the northeast and a U.S. force on the southwest. The Viet Cong were said to be trying to escape past the South Vietnamese troops, some of them in small boats on the Saigon River. In the Chinese Cholon section of the capital, fighting broke out in front of a children’s hospital. 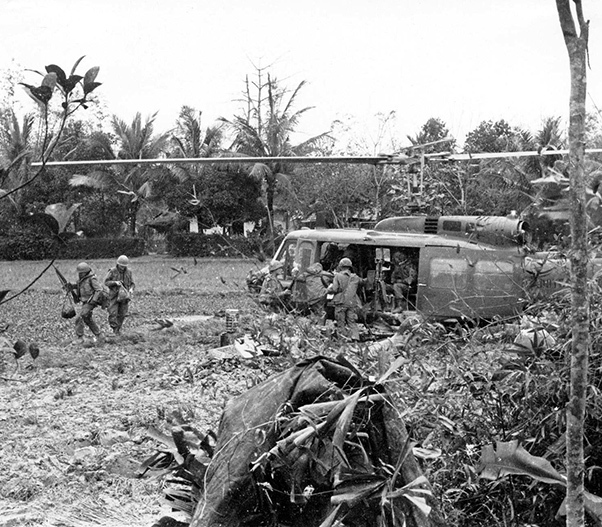 Cholon was hit by six Viet Cong mortar shells during the night. At Hue, a main gate of the citadel was reported wrested from Communist control. The U.S. Command said the enemy withdrew into the northern part of the old walled areas under repeated strafing and rocket raids by allied fighter-bombers. Among the targets of the allied planes were anti-aircraft guns the Communists had mounted on the towers of the citadel’s outer wall. Earlier, the U.S. Command had reported that the enemy was holding onto two corners of the citadel. 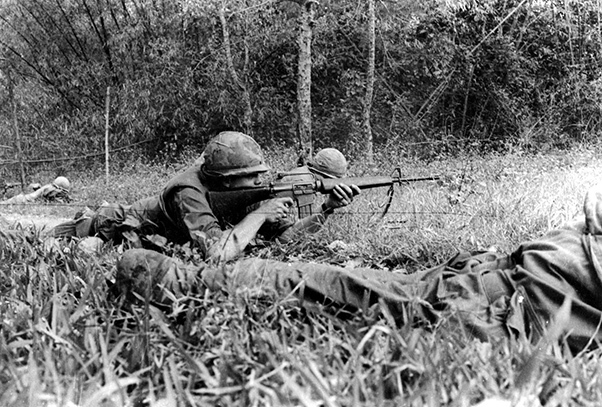 The allies reported killing more than 300 enemy in bitter fighting at Hue, Friday. One illustration of the tremendous property damage the Communist offensive has caused was a report from President Johnson on the toll of aircraft at American fields across Vietnam. He said 16 planes and 23 helicopters were destroyed and about 100 other planes so severely damaged that they would have to be replaced. The average cost of American warplanes is estimated at $2 million. HUE, VIETNAM–Four battalions of Communist troops control most of the streets of Hue, Vietnam’s ancient imperial capital. They are resisting allied forces with machine guns, mortars and rockets. The enemy fire was so intense today that two U.S. helicopters attempting to run the gauntlet to collect wounded were shot down over the city. U.S. Marines and infantrymen and South Vietnamese troops are battling more to maintain their positions than to oust the enemy. The Viet Cong-North Vietnamese force deployed through the city holds a major part of the old walled Citadel, formerly the seat of kings but now a pile of ruins, and the headquarters of the South Vietnamese army’s 1st Infantry Division. South Vietnamese troops hold a small part of the Citadel. The Americans are fighting from a half-block square compound that houses U.S. advisory headquarters. The city is now in its fourth day of virtual siege. Refugees have poured in, swelling the normal 40,000 population enormously. Civilian casualties are believed to be extremely high. The allies also control the bridge across the Perfume River that joins the city. The Communists burst upon Hue four days ago, and both the province chief, Lt. Col. Phan Van Khoa, and a senior American civilian adviser for pacification may be in enemy hands, Americans at this compound believe. A platoon of U.S. Marines fought its way to within sight of the American adviser’s house three days ago, but Viet Cong soldiers were surrounding the building. American and South Vietnamese planes strafed and rocketed Communist positions in the heart of Hue today. There were reports they had been ordered not to drop bombs because of the civilians. At one point during the afternoon, American Marines and U.S. Army advisers were directing huge volumes of fire onto the street from this three-story building on the western edge of the town. They were trying to cover the dash of four armored trucks to evacuate wounded Americans at a boat ramp at the edge of the Perfume River. In addition to the senior pacification adviser, concern is also felt for nine other American civilians in the city. Some of the U.S. Marine companies have reportedly suffered heavy casualties. At least 10 Marines are known to have died, and another 108 have been wounded. There have been heavier casualties among the South Vietnamese troops, U.S. advisers say. No one really controls the city. There are islands of government resistance and islands of Viet Cong strength. 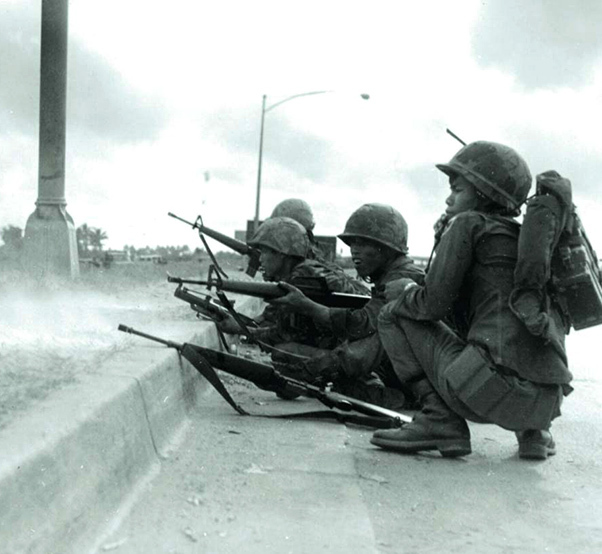 The South Vietnamese battalions are fighting in the northwest portion of the city, where the old imperial Citadel is located. Viet Cong flags can be seen flying from some of the ancient battlements. The intense fire has ripped the branches from the trees and stripped the bark. The streets leading from the American compound are completely deserted and littered with debris. The roof has been blown off the high school across from the compound. The Viet Cong are thought to be in control of the province headquarters, the central market and the main hospital. “We had only one street, the street we were standing on,” said Marine Lance Cpl. Dwight Foster of Marianna, Ark., after one foray. Foster and his platoon were caught in a big firefight and pulled back to the third floor of an old hotel which is part of the U.S. compound. It had previously been the non-commissioned officers club. Foster and his men peeked out of windows, fired at the Communists and ducked back. When a sniper appeared across the street, a tank opened up with a barrage of .50-caliber machine-gun fire. The scene was repeated all over the compound. Suddenly, no place was safe. Saigon became as dangerous as the Ca Mau Peninsula. The idyllic resort of Da Lat in the central highlands became a prison for vacationers as South Vietnam suffered its bloodbath in the first days and nights of the lunar new year. Nearly 140,000 persons died in 10 days, official figures show – a bloodletting that must rank with the great slaughters of Vietnam’s tortured 4,000-year history. The catalyst was a bold Communist attack on all the city strongholds below the 17th parallel. The resultant conflict has changed the pattern of the war. It emerged from the jungles, swamps and villages where it was fought for years, and came to the cities. Black-clad guerrillas who dwelt in the dark rain forests of the Communist war zone marched across broad paddy fields and unprotected hamlets into the capital itself. Turmoil and destruction invaded the homes of hundreds of thousands who thought they had escaped war’s horrors in the security of the major towns. Two weeks of carnage indicated that all that had gone before might merely be the curtain raiser to the main event. The Communists swarmed over a metropolitan Vietnam that was sleeping off the happiest holiday of the year. Ironically, the allied high command was well aware that the Communists were on the move somewhere. Driblets of intelligence collected in all parts of the country indicated the drift of Communist units toward the cities. Little notice was taken. The euphoria of the lunar new year had overtaken everyone except the American field forces that clung tightly to their firebases in expectation of a lunar truce, and the Communists, who had no intention of observing the holidays or the truce. They struck while Saigon rocked to firecrackers and the revelries of Vietnamese holiday bacchanal. Jungle soldiers who had never worn shoes dug their toes into thonged rubber sandals to protect their feet against the hard city streets. Weapons and ammunition that had been surreptitiously buried inside coffins during mock funerals in previous weeks were dug up from city cemeteries. The Communist infrastructure, those hundreds of outwardly loyal citizens who comprise the hidden apparatus of the enemy, led to assembly points the troops they had concealed. The attacks were coordinated on a master plan. First, the sappers launched suicide assaults against the most important buildings. Then shock troops lashed at peripheral military installations. The battle was on — at Saigon, at My Tho, in the Delta, the Highlands, the Coastal Plains. The cities and towns not attacked in the first day were hit the second or third day. Death plucked at every layer of Vietnamese and American life. It sometimes came to those who panicked. A wealthy Chinese importer gunned his late-model French car through a Saigon intersection instead of heeding the stop whistle of a U.S. military policeman. He was shot dead by the nervous sentry. Two American employees of Pacific Architects and Engineering, Doyle V. Clark, 33, from Covina, Calif., and Billy C. Stein, Sacramento, Calif., both entomologists, leaped into their Jeep when fighting erupted near their home beside the Saigon gold course. Both were killed 20 yards from their gate. A neighbor, Mike Mealey, a young Californian, elected to stay under his bed for 29 hours. He survived. The communists sometimes picked their victims at random. At the Central Highlands city of Ban Me Thuot, they overran the Christian and Missionary Alliance and killed five American missionaries, three men and two women. Yet inside the city they occupied the home of a U.S. education specialist, Dr. Jane Ford, and let her live. They used her home as a command post. In the delta city of Chau Phu, the Viet Cong pushed half a dozen American nurses into the bathroom and locked them in for the 36 hours they held the houses. But in a nearby province, New Life hamlet specialist Hugh Lobit, a big, rangy Texan in his mid-30s, was gunned down in his favorite pacified village. Other foreigners just disappeared, like a reputed millionaire Australian who made his money in duck feathers, Keith Hyland, a trim, debonair 54, who visited his factory in the Chinese suburb of Cholon. He was captured by the Viet Cong and hasn’t been seen since. Or civilian and official Mike Benge, from Heppner, Ore., an expert on Montagnard affairs, who disappeared into Viet Cong captivity in the Central Highlands.